Michele M. Howard began writing professionally in 2009, producing sports, fitness, home improvement and gardening articles for various websites. In addition to writing, Howard is a United States Professional Tennis Association tennis instructor and a professional racket stringer. Howard holds a Bachelor of Arts in mathematics from Southern Connecticut State University. The way the sport of tennis is played today, it places a lot of physical demands on your body. In order to be successful and compete at your very best, you must have a specific kind of stamina and endurance. In tennis you repeat hundreds of quick, short, explosive moves over the course of several hours -- three hours or more in a long three-set match. This type of stamina and endurance requires a training program with speed and agility drills, aerobic and strength exercises and interval training. Set up a training program for the offseason. If your tennis is year-round with no breaks, ease back on the intensity of your training sessions and only perform light workouts one to two weeks before competition. Throughout the year, complement your training with on-court practice matches. Get in the habit of warming up before your drills and workouts. The U.S. Tennis Association recommends a 10-minute dynamic warm-up. This type of warm-up consists of stretching exercises with movements that resemble the way you move when you play tennis. Examples of dynamic stretching exercises are walking lunges, side-to-side shuffling and arm circles. Perform speed and agility drills, such as the spider drill, two to three times each week. Stand on the baseline's center hash mark and run to the right corner where the singles sideline meets the baseline. Touch the corner with your foot, run back to the hash mark and without stopping, run diagonally to the right side "T." This is where the service line meets the right sideline. Touch the "T," run back to the hash mark and then run forward to the "T" where the center service line meets the service line. Touch it, run back to the hash mark and then run diagonally to the left side "T." Touch it, run back to the hash mark and then run to the left corner. Touch the corner and run back to the hash mark to complete one repetition. Rest for 40 seconds and repeat until you have completed five reps. Increase the number of reps by one with each training session until you can perform 15 reps. Perform strength-training workouts three to four times per week to build muscular endurance and to improve your aerobic capacity and cardiovascular endurance. This can be done by performing two to three sets of strengthening exercises using low resistance for a high number of reps per set -- 15 to 20 reps. Include in your workouts exercises to target the major muscle groups of your upper and lower body. Allow a minimum of 24 hours between sessions for muscle recovery. Run intervals with a work-to-rest interval of 1 to 2 or 1 to 3, recommends Mark Kovacs, certified strength and conditioning specialist with the USTA. For example, sprint for 15 seconds, rest for 45 seconds and then repeat. 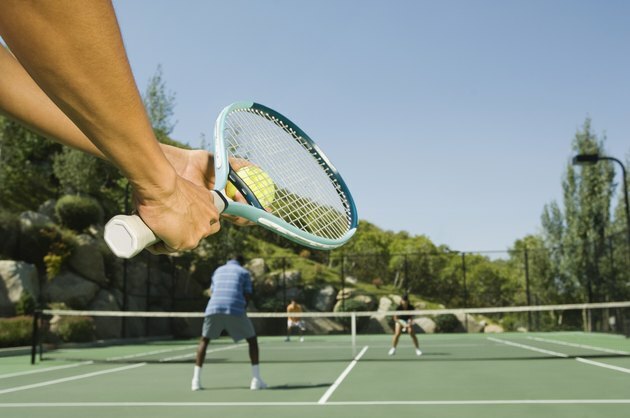 Varying bursts of energy with periods of rest mimics the way you play points in a tennis match. This type of training helps improve your endurance while keeping your on-court fatigue to a minimum. Depending on your fitness level, perform intervals three or four times per week for 20 to 30 minutes. Perform a 15-minute cool-down after your drills, training sessions or practice matches. Cool-down exercises help you recover physically, help “flush out” metabolic waste products and help to keep your muscles from tightening up. Sample exercises include several minutes of walking or a light jog. In your cool-down, include static stretches to limit muscles soreness. Static stretches involve stretching your muscles and holding the stretch, with no joint movement, for 20 to 30 seconds. Keep a log of your progress. Note your times, number of reps and number of sets. This helps you stay motivated and challenges you to increase your times, reps and sets with each session. Avoid overtraining. If you experience joint pain or soreness for more than 72 hours, stop and consult your health care provider.